What this means in reality is that a normal application for an isolation transformer is to either keep the load from generating harmful harmonics back onto the distribution bus, or to keep harmonics already on the bus from continuing downstream to sensitive loads. All UPS systems are "online": that means they are sampling the incoming waveform and acting upon it to provide "clean" power at the output. For the double-conversion UPS units, which are like mini-AC drives coupled back-to-back across a small internal DC bus. If the transformer is intended to isolate downstream loads (below the UPS itself) from potential harm originating at the distribution bus, then the bypass connection would have to be examined closely. In most cases, the bypass basically provides an alternate path directly to the load. This means that in bypass mode (with a downstream of the UPS iso-XFR), there is a good chance that anything on the bus will appear at the load with no mitigation. If the iso-XFR is between the bus and the UPS, then anything generated by UPS or load is isolated from the bus, and anything on the bus is isolated from load - even in bypass mode. 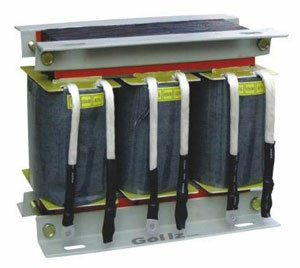 There are several reasons why an isolation transformer is used. The UPS supply may be on a high resistance grounding system and the loads require solid grounding. The output of the UPS may be at a different voltage than the loads. Used to limit the fault current for downstream equipment. If a voltage transformation is required, having the transformer external to the UPS system makes isolating the UPS for maintenance easier. Most importantly as a step down/up voltage converter - but strictly speaking they are not necessarily "isolation" class. The only real disadvantages I can see would cost (not always more expensive) and space requirements which are typically outweighed by the advantages. Most commonly isolation transformers are used where there are very sensitive instruments that need protection from the "noise" on the grid. The classic examples are heart monitors in hospitals and other hospital life monitors. The monitor is usually plugged directly into the isolation transformers before even connecting to the UPS. Since probably 95% of UPS units are the "buck and boost" type with the battery floating in parallel to the rectifier inverter connection rather than in series between the rectifier and inverter the UPS grounding makes the unit useless for isolation of harmonics. In a good many states it is a code violation in "critical infrastructure" to have continuity of ground conductors. If you need grounding on the critical side you use a separate earth ground. Good example is the old Mission Control Center at Johnson Manned Spacecraft Center. Everything had to be isolated in order to qualify for "Manned Rated" space flight. Some equipment was vacuum tube because solid state was too primitive in those days. Even the substation on the HL&P grid serving JMSC had special grounding and circuit routing. what is the major difference between , in an ups isolation transformer is input and at output.